Good Morning! In the theme of things you aren't surprised about, I am late to the party again. I was reluctant to try jeggings, join Twitter, try out the Canadian Tuxedo, purchase a faux fur vest, and I am just now introducing myself to colored denim. And just like all of those things before, I am HOOKED! Super cute sweater paired with your red jeggings! I too have been staying away from color denim but I'm ready to hop on the bandwagon! 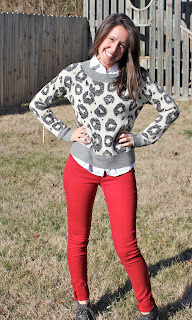 I definitely need to get some red skinnies, I see them everywhere these days and they look so adorable on you!! What a gorgeous outfit! 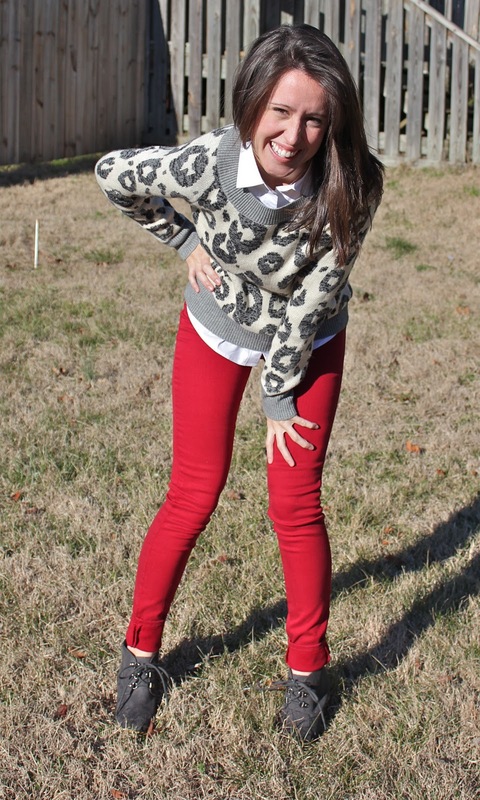 I love those red pants! Next pant fab: Bleulab's Reversible Jeans!! Yay, so glad you got on board with the colored denim trend! 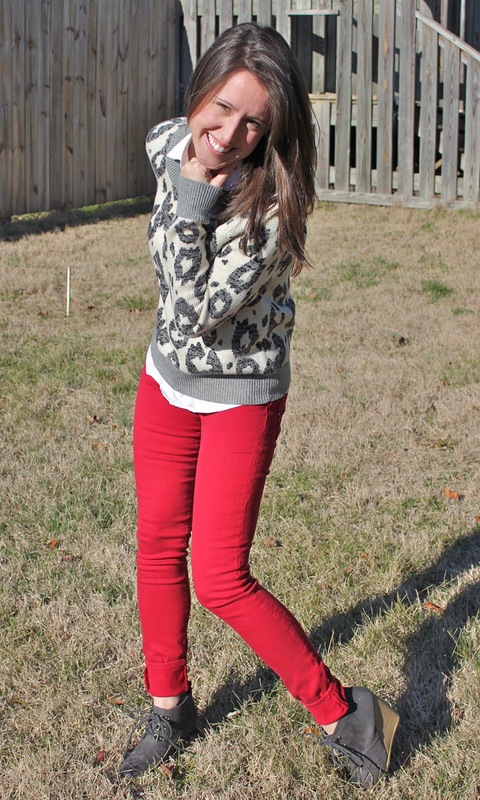 I love my red jeans (from Zara). Yours look awesome on you! Those red jeans look AMAZING on you! I'm glad you decided to hop aboard the colored skinny pants bandwagon. :) And I didn't even know they had these at GAP! Once it stops snowing here, I'll have to go check them out. Whoops. I didn't mean to include the comment about the kitchen. That was totally a cut-n-paste typo. Haha! Sorry! Thank you! 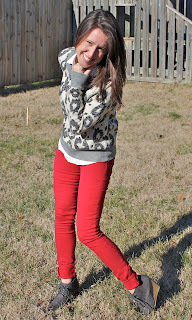 And for some reason, red seemed like the most approachable color of denim to start with... and so far I am loving mine! Michelle! I am so glad you posted, and for introducing me to reversible jeans! that is BANANAS! Ooh! those red Zara ones were being stalked by me for quite some time. Yay for you being lucky enough to scoop them up! Haha! No worries! Hope you braved the snow to get some shopping done!